The new Keurig coffee machine, the 2.0, is the latest offering from this brand. With all of the favourite features and a few new tweaks and additions, the 2.0 is taking the market by storm. We have tried and tested the Keurig K575 and we are ready to share our findings and insights with you so you can judge for yourself whether or not you think the new Keurig 2.0 is for you. The Keurig K575 Reviewed - What are it's features? ​The Keurig 2.0 has one of the biggest water tanks on any model holding a staggering 80oz water meaning you can brew around ten cups without having to refill the tank. The tank is removable for when you do need to refill it and also for easier cleaning. The water tank has an inbuilt nightlight too with a choice of several colours so you can make a late night coffee without needing to have an overhead light blaring out. The Keurig 2.0 gives you five different cup sizes – 4oz, 6oz, 8oz, 10oz and 12oz. It also introduces the facility to use K-pot capsules which make a full carafe of coffee for when one cup just won’t do! The carafe sizes can be pour at 22oz, 26oz or 30oz. Keurig 2.0 “My K-Cup” reusable coffee filter: This handy little device is a reusable capsule which you can fill with your own freshly ground coffee if you prefer to drink your coffee that way. If you already have a reusable Keurig k-cup from your previous model coffee machine, it will be compatible so you don’t need to buy another one. 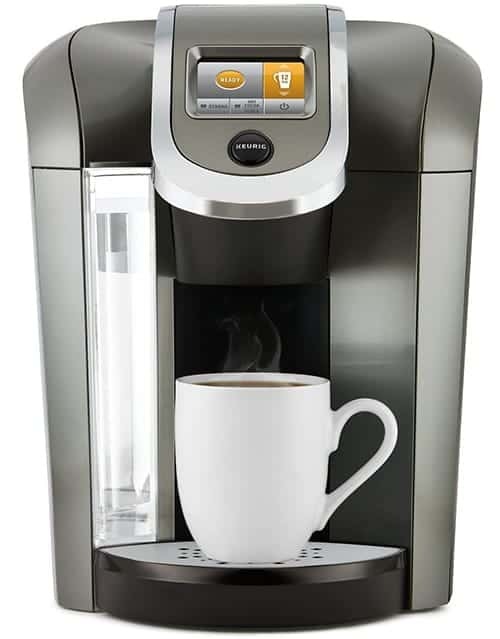 With two hundred and fifty variations spanning seventy five popular brands of coffee, tea and hot chocolate, the Keurig 2.0 is sure to have something to suit every taste. The drinks brew quickly enough that you can make a round of drinks if everyone wants something different and all still enjoy them together. The spout doesn’t require cleaning between each drink and there is no cross contamination of flavours. The large screen is a touch screen and is full colour. Programming your settings is easy – just follow the on screen instructions. The machine is contemporary in design and will look super stylish in your kitchen as well as making delicious drinks that are perfectly matched to your individual tastes. The Keurig 2.0, like other models, is recommended to be used only with Keurig branded capsules. Unlike other models, the 2.0 has a sensor built in, which, in theory, prevents you from using other branded capsules. The work around to this is to buy one Keurig branded pack (or use one of your freebies that are included). Once you’ve used the capsule, cut the label off and pop the part with the code on the reader. Close the lid as though you entered a capsule. The paper will stick to the reader so it will now think any capsule is a Keurig branded one. Please note: This isn’t recommended by the manufacturer and if you do choose to do this and it causes a problem, you won’t be covered by your warranty. This machine is perfect for anyone who appreciates a decent coffee that’s easy to make and with plenty of choice options. The speed at which the machine works, and especially with the k-carafe capsules, this machine is perfect for anyone with a larger family or who regularly entertain as there is no messing about between cups. Really, the only people who won’t love this machine are people who don’t like Keurig capsules. This machine does everything you would want a coffee maker to do and a bit more besides. It’s the perfect solution to your coffee needs and we highly recommend giving this machine a try! Bunn MCU Review- Is it worth? Great thorough review, thank you!